1. Mode Display Displays currently operating mode. 2. 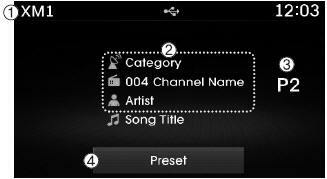 Channel Information Displays the category, channel number, channel name, artist and title information. 3. Preset Displays currently playing preset number  ~ . 4. Preset Display Displays saved presets. Press the key to play the previous/next channel. Turn the TUNE knob to select the desired channel. Press the key to scan all channels with superior reception for 5 seconds each. Once scan is complete, the previously played channel will be restored. During Scan, pressing the key again will cancel the scan operation and restore the previously played channel. If the “Category” icon is displayed, channels are changed within the current category. 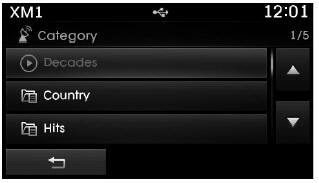 Select the category by using the key and press the TUNE knob to select. 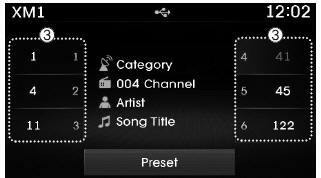 Channels for the selected category are played. Press the button to display the broadcast information for the channel saved to each button. Press the ~ buttons to play the desired preset. While listening to a channel you want to save as a preset, press and hold one of the ~ preset buttons (over 0.8 seconds) to save the current channel to the selected preset. This device has been manufactured to be compatible with software bearing the following logo marks. Do not clean discs with chemical solutions, such as record sprays, antistatic sprays, antistatic liquids, benzene, or thinners. After using a disc, put the disc back in its original case to prevent disc scratches. Hold discs by their edges or within the center hole to prevent damages to disc surfaces. Do not introduce foreign substances into the disc insert/eject slot. Introducing foreign substances could damage the device interior. Do not insert two discs simultaneously. When using CD-R/CD-RW discs, differences in disc reading and playing times may occur depending on the disc manufacturer, production method and the recording method as used by the user. Clean fingerprints and dust off the disc surface (coated side) with a soft cloth. The use of CD-R/CD-RW discs attached with labels may result in disc slot jams or difficulties in disc removal. Such discs may also result in noise while playing. Some CD-R/CD-RW discs may not properly operate depending on the disc manufacturer, production method and the record method as used by the user. If problems persist, trying using a different CD as continued use may result in malfunctions. The performance of this product may differ depending on the CDRWDrive Software. Do not use abnormally shaped discs (8cm, heart-shaped, octagon- shaped) as such discs could lead to malfunctions. If the disc is straddled on the disc slot without removal for 10 seconds, the disc will automatically be re-inserted into the disc player.